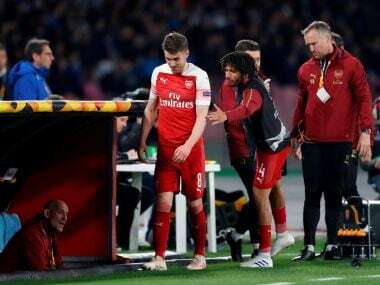 London: Arsenal's hopes of sending outgoing manager Arsene Wenger off with a trophy suffered a major blow as they could only draw 1-1 with 10-man Atletico Madrid in the first leg of their Europa League semi-final on Thursday. 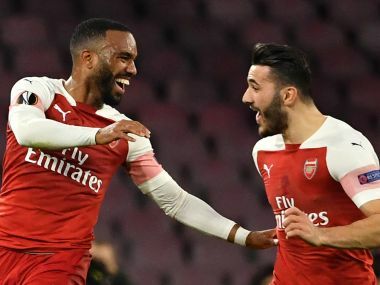 The Gunners played with an extra man for over 80 minutes at the Emirates Stadium, with Sime Vrsaljko's early red card handing them the initiative. However, they were made to rue a host of missed chances before and after Alexandre Lacazette headed them in front on the hour mark. Atletico coach Diego Simeone was also sent to the stands shortly after Vrsaljko's dismissal, but the Spaniards resisted manfully and pounced when their chance came as Antoine Griezmann prodded home a vital away goal eight minutes from time. Arsenal now need to become the first away team to score in 12 matches at Atletico's Wanda Metropolitano stadium next week if Wenger's last game in charge is to be the final in his homeland in Lyon on May 16. 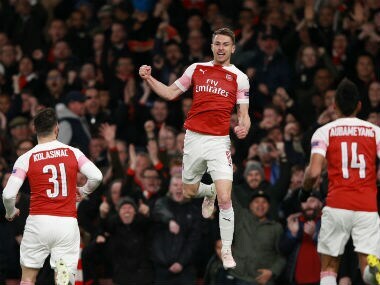 Moreover, Arsenal's hopes of Champions League football next season also hang on becoming the first side other than Real Madrid to eliminate Atletico from Europe for five seasons. There was a far more highly-charged atmosphere for Wenger's penultimate home game in charge than there had been for last weekend's game against West Ham United. And the hosts were given plenty of encouragement early on, even when still up against Atletico's full complement. Lacazette volleyed off the outside of the post and forced Jan Oblak into the first of a series of fine saves with a header from close range. Vrsaljko had been booked within two minutes for bringing down Jack Wilshere. And the Croatian left his side a man light after just 10 minutes when French referee Clement Turpin showed no leniency for another late challenge on Lacazette. Moments later, Simeone was also dismissed by the officious referee for taking his protests too far when an Arsenal player wasn't booked for what he thought was a similar foul. Atletico's excellent defensive record is what has carried them to five European semi-finals in seven seasons under Simeone. The visitors battened down the hatches with 10 men, but were reliant on Oblak to keep them in the tie. Wilshere headed straight at Oblak when unmarked at the back post at the end of a flowing Arsenal move. And the Slovenian then spread himself well with an outstretched leg to deny Danny Welbeck. 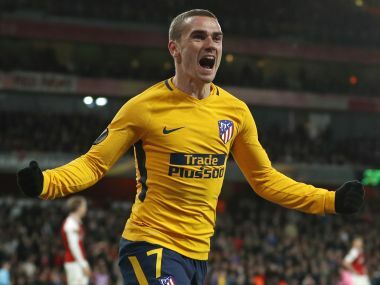 Having weathered the Gunners' early storm, Atletico only began to threaten themselves late in the first half and David Ospina had to be alert to parry a fiercely struck Griezmann shot following a fine run from Thomas Partey. Atletico retreated ever deeper towards their own goal after the break and were finally punished on the hour mark when Wilshere's deep cross found Lacazette rising above Lucas Hernandez to head in his seventh goal in seven games. However, the French international and Arsenal could have had more. Laczette's dangerous ball across goal found no takers before he headed another good opportunity wide. And Arsenal paid heavily for their profligacy, and some comical defending, when Atletico grabbed a vital away goal on 82 minutes. Griezmann outmuscled French international team-mate Laurent Koscielny and then benefited from a slip by Shkodran Mustafi after his initial effort had been saved by Ospina to prod his 27th goal of the season into the roof of the net. 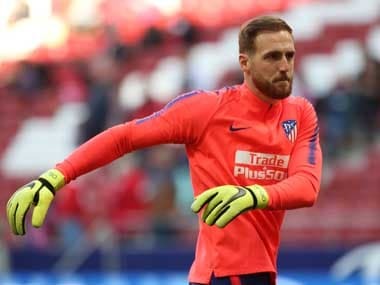 There was still time for Oblak to show why Griezmann isn't the only Atletico player wanted by Europe's elite with a spectacular one-handed save to turn Aaron Ramsey's header behind and keep Los Rojiblancos on course for another European final.